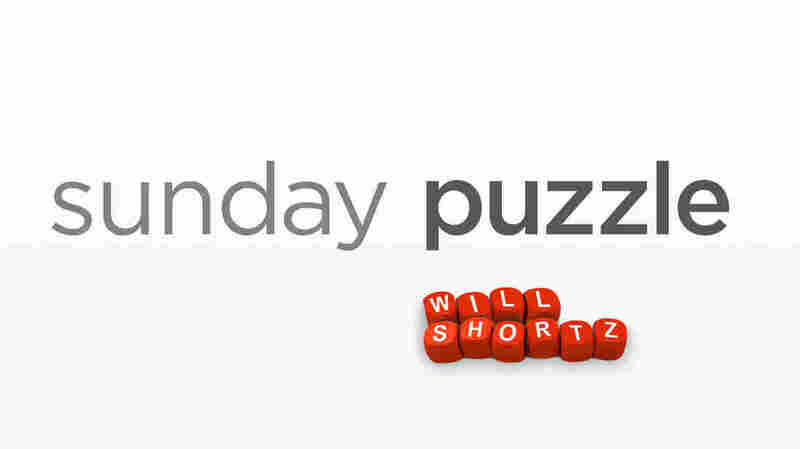 Sunday Puzzle: Not As Advertised NPR's Lulu Garcia-Navarro and puzzlemaster Will Shortz play the puzzle with Elizabeth Lampert of Scarsdale, N.Y.
Last week's challenge: The challenge comes from Peter Collins of Ann Arbor, Mich. Think of a two-word phrase a child might shout when walking in the front door. Rearrange the letters and add an "E" at the end, and you get the next two words the child might shout. These are both common expressions. What are they? Winner: Elizabeth Lampert of Scarsdale, N.Y.
Next week's challenge: The challenge comes from listener Ben Bass of Chicago. Take the title of a famous Hollywood flop. Change an A to an R, then rearrange the letters to spell a famous box office hit — which went on to spawn sequels. What films are these? If you know the answer to next week's challenge, submit it here. Listeners who submit correct answers win a chance to play the on-air puzzle. Important: Include a phone number where we can reach you Thursday, May 24 at 3 p.m. ET.